I honestly started your present early this year, but part of it is on order and the other (woefully inadequate) painting isn't done yet. Hopefully I'll be able to finish it up this weekend, maybe even before then. (There's nothing like a good slew of Criminal Minds on the DVR to supplement a marathon painting session. Of course, then I want to doodle Will and Spencer having a slumber party and wearing fuzzy feetie pajamas. X_x''') In the interim, I have a small and hopefully amusing Abigail Hobbs sketch. Because I'm still not sure who I'm more pissed off about-- Abigail, or Beverly. I had fun doing the fingerless gloves and her 'little-red-ridding hood cloak'. She probably got the stag's-skull corset from the same place Hannibal and Chilton buy their decor. ^_~ I added goobers-- there are few people I can think of less physically and emotionally capable of eating goobers than Hannibal Lecter. (Lex Luthor? Erik Lehnsherr? Spock?) Just regular ink pen on steno paper, but I hope it gives you a laugh. 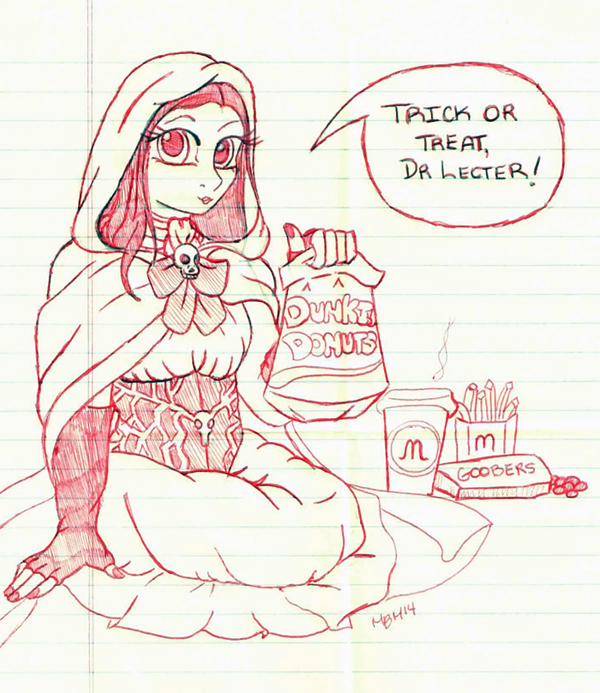 (a) I love the sketch, and all the little details--like, yes, her fingerless gloves! So perfect. (c) Most importantly: Amber does indeed deserve the best, and I'd like to be the first to volunteer for your beating-up-dissenting-people army. I don't have anything as cool as this post to offer, Amber, but let me hitch a ride on Meredith here and say: happy birthday and *hugs* too. Thank you so much for the comments on the sketch! I had so much fun doing it. STILL TOO MANY FEELINGS ABOUT HANNIBAL, MUST FILL THE VOID WITH SERIAL-KILLER MEDIA THAT DOES NOT MAKE ME FEEL LIKE I'VE BEEN EMOTIONALLY DISEMBOWELED." This artwork is beautiful. Hannibal Lecter's aversion to McDonald's will always be one of the funniest things in the world to me. And thank you. <3 Gosh, I am so glad we know each other, I am so glad to have you in my life. You are wonderful.